This is a new feature I have added to the blog, and Goose has graciously agreed to be the first one. The first thing that caught my attention when I visited her blog, was the name, I thought to myself: ok the word glitter is in the name, so this should be awesome; and it was! Then, I realized her nails looked so familiar to me, they looked a lot like mine. When I started blogging, in a way, this gave me some confidence. I have always liked her swatches, and I have been a follower since that first day. Here is a glimpse at her amazing pictures, and what Goose has to say about this lovely post. "I don't know what came over me to try this out, but I've FINALLY come up with my own original idea! (Most of my designs are at least inspired by another blogger's design). For some reason, I decided on a gold and army green half moon, and it came out even better than I expected! The reason I list the top coat in between the colors as important is because this allows for some cleanup of the lines. I've heard of bloggers using reinforcement stickers to make the half moon lines, but I prefer Liquid Palisade. Either way, the lines seldom come out perfect right away, so the top coat over the base color allows for some LIGHT cleanup using a brush and acetone (which is what I normally touch up my nails with anyway). This also works for French tips and any other tape mani as well." Ficou linda a combinação dela!! Very pretty! 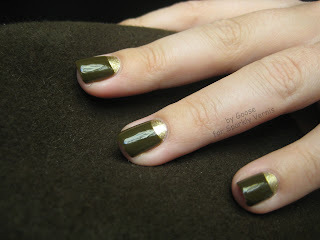 I like the color combo, that olive green is not something I would normally go for but it's pretty with the gold! @ Rafaa C.: IKR? I love the combination too!